We have received several reports that the CFIA is not returning phone calls and is sending out a generic auto response email in regards to recent concerns brought forth over horses being live shipped to Japan for slaughter. Questions are not being answered – the CFIA is, yet again, not taking responsibility for their actions. While we are not surprised by this lack of communication and poor judgement, we need to show them that we aren’t going to stop pursuing this until we see and end to it. Demand to know why, for the past 20 years, the CFIA have not been enforcing their own regulations. 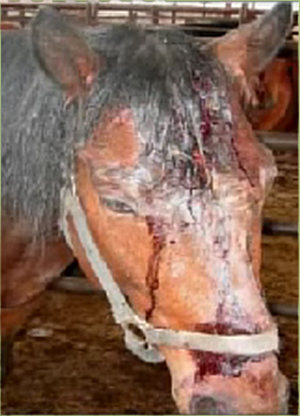 Demand to know how many horses have died because of their negligence. Demand to know what changes will be made to ensure that no more horses die, overcrowded in crates so small that they cannot stand in a natural position. Demand to know why the countries where these horses are shipped to don’t have to report what condition the horses arrive in. Note: it has recently been revealed by the CFIA that horses originating from Canada arrived dead in Japan in August 2012. This entry was posted in Alerts, Animal Cruelty, Horse Slaughter, PMU, Transport and tagged belgian, Calgary Airport, CFIA, draft horses, George da Pont, gerry ritz, horse slaughter, Ian Alexander, japan, korean air cargo, Martine Dubuc, Nicole Cormier, Nippon Cargo Airlines, percheron, Servisair. Bookmark the permalink. 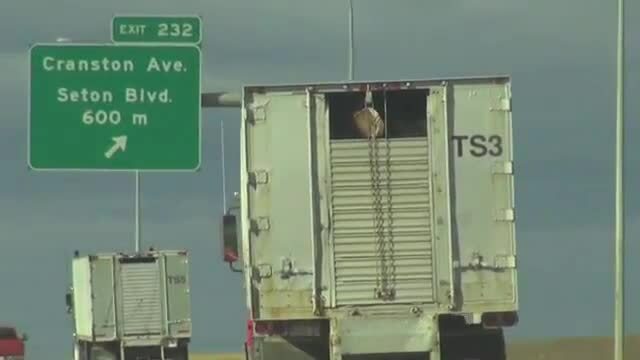 CTV in Saskatoon, SK reports on shipments horses in crates from Calgary International Airport to Japan for slaughter: http://saskatoon.ctvnews.ca/video?clipId=795033. For the full CHDC investigative report video, see it here: http://www.youtube.com/watch?v=Ji5n8siQGAw&feature=plcp. CTV London, Ontario, ran a story last week about three older Standardbred broodmares whose owner issued an order to have them shipped to the OLEX auction “for meat”. The plight of mustangs and burros is a hidden tragedy – Americans do not realize what is taken from them and how cruelly. The footage of recent stampedes is shocking, the hasty gathers and wipe out of whole herds speak volumes of destruction and despair. Tax payers are funding this atrocity, under the guise of “management”. 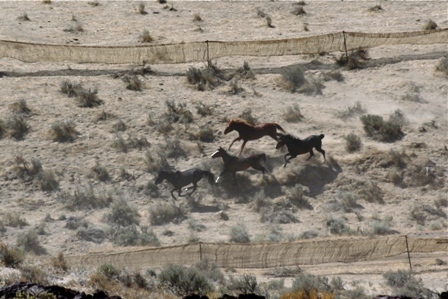 Read this article: http://readersupportednews.org/pm-section/27-27/9442-tragedy-disguised-the-extinction-of-americas-last-wild-horses-and-burros Wild horses are safe only on the range, where they enhance the eco-system. Their evolution is here, and they positively contribute to soils, plants, animals and people and help prevent wild fires. Government has too long targeted them for elimination and wrongfully blamed them for damage caused by cattle. The negative schemes must be exposed. Read Craig Downer’s compelling book: “The Wild Horse Conspiracy”. It will blow your mind on the true story of the West and how the Fed’s destroy this heritage in a cleverly deceptive agenda. 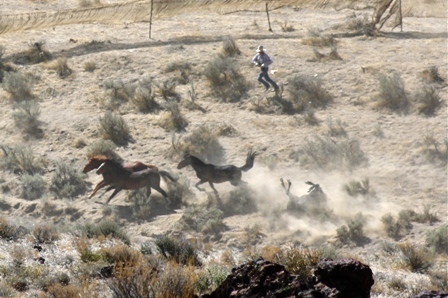 He has defended wild horses over 40 years against the merciless attacks of BLM and special interests. It’s time people find out the truth. Please sign this petition, with all that failed in years against this massive eviction, we must maintain our voice for these defenseless icons. 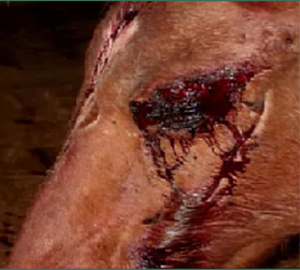 Wild for Life Foundation is pleased to announce the release of its brand new Flash media PSA, ” Justice for America’s Horses“, a public service announcement to raise awareness about the cruelty of horse slaughter. The 1 minute PSA comes in the wake of the recent push by foreign investors to expand a niche market for horsemeat sold as a delicacy abroad. JUSTICE FOR AMERICA’S HORSES was made possible by generous in kind contributions to Wild for Life Foundation from IMA Studios, Maria Daines, Paul Killington, Animal Law Coalition, Kaufman Zoning, Animals Angels & John Holland. WSPA has released a new report, What’s on Your Plate? The Hidden Costs of Industrial Animal Agriculture in Canada that exposes the destructive impacts of ILOs on our health, the environment, animal welfare and rural Canada. Mr. Craig C. Downer is a well respected Wildlife Ecologist and Author with whom I am privileged to maintain contact with. Craig’s battle to protect the wild horses and burros throughout the US is well known, his expertise, knowledge along with his determination, commitment and pro-active undertakings need be commended. Craig’s most recent publication “The Wild Horse Conspiracy” presents more than enough evidence of the evolution of and the survival of the first wild equids throughout North America. A fact that is highly contested and denied by the BLM and the US pro-slaughter advocates in Office. In reading Craig’s book, it is clear to me personally and to others who have read it, that there is indeed a conspiracy to exterminate wild equids across the US, and while oumay draw your own conclusions as to why, I for one believe it is to serve the cattle industry and big business. Canada is just as guilty, by way of importing these captured mustangs into Canada, destined for Canadian horse slaughter plants where these magnificent animals are brutally and inhumanely slaughter, their meat products being shipped out to foreign countries. Note that undercover videos of what takes place in these slaughter houses in Canada have been made public….it is disgusting, sickening and beyond comprehension. Furthermore our own wild horses are being rounded up and slaughtered as well. equids so pursued (5% or more). They break up the family (band) social structures and actually result in more uncontrolled breeding among those left in the wild. This is because the equid societies when in tact keep breeding suppressed especially in subdominant and younger members. This has been well documented (ref. Karen Sussman of ISPMB). Additionally, the brutal roundups cause great anguish among the wild equids. 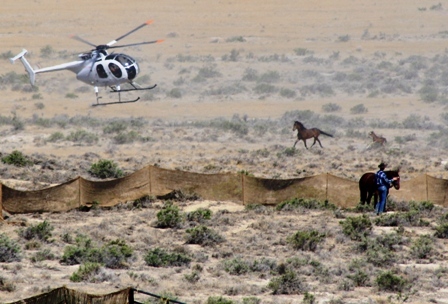 Those wild horses and burros who lose their freedom in this insensitive manner suffer an equid form of Post Traumatic Stress Disorder for the rest of their lives, as attests how violently they react when a helicopter approaches overhead. Other brutalities suffered during the penning and sorting process and standing around in crowded feedlots often for years on end also leave an indelible mark on theirpsyche. I consider your massive roundups by helicopter then chucking the horses and burros off to the holding pens to be a very insensitive and unintelligent way of dealing with them. It shows that whoever is running this program is from a livestock background and has little appreciation of the horse or burro in the wild — in fact its truer nature given its ancient, multi-million year development as a wild and free species. These animals quickly revert to the wild when given the chance, and North America is their evolutionary cradle and place of long-standing development, though they also fit in well in the Old World. The equid is not an ruminant, but a post-gastric digester and as such contributes by building soils and dispersing intact seeds to a much greater degree than is the case with ruminant grazers – practically all the others in North America. I urge you to study my book The Wild Horse Conspiracy, especially the part concerning Reserve Design for naturally self-stabilizing populations and how to achieve this. 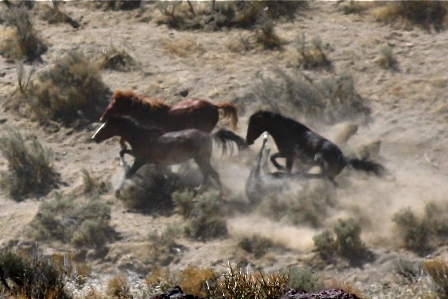 This would comply with the true intention of the Wild Free-Roaming Horses and Burros Act of 1971, not the mayhem and suffering, social and ecological disruption that your draconian helicopter roundups and grossly unjust Appropriate Management Levels for the herds are presently causing. Please contact me for a copy of my book or portions concerning Reserve Design. So much is coming in..fast and furious..but not as fast and furious as these magnificent horses MUST RUN FOR THEIR LIVES. 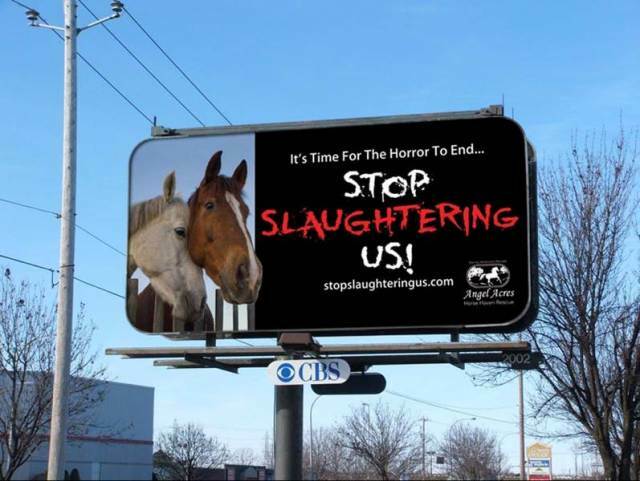 “April 10, 2012 (Larkspur, Colorado) — Through its own investigation, Front Range Equine Rescue (FRER) has discovered that Valley Meats Co., 3845 Cedarvale Rd., in Roswell, NM, has applied for inspection of horses to be “custom slaughtered” and “processed” for human consumption. According to the facts uncovered, the facility has been involved in extended discussions with the Denver office of the Food Safety and Inspection Service (FSIS). The FSIS inspects animals and meat in American slaughterhouses under the auspices of the U.S. Department of Agriculture. An ABC News Brian Ross Investigation on Nightline tonight. Inside the multi-million dollar sport of Tennessee walking horses. Investigators find that some of the seemingly graceful horses are subjected to incredible brutality and torture to make them perform in such a unique way, all in the pursuit of blue ribbons and championships worth tens of millions of dollars. The story will feature an exclusive undercover video investigation by the HSUS and Brian’s encounter with Jackie McConnell – a top trainer who’s been indicted.